The cheaper RX-V373 picked up the Award for best budget AV amp and it’s now even cheaper still, offering an outstanding value-to-performance ratio. It’s ‘only’ a 5.1 system (100W a channel), so you don’t have quite the flexibility for your speaker set-up as with the other amps here, but at the level it’s aimed at, this is unlikely to be a huge issue. 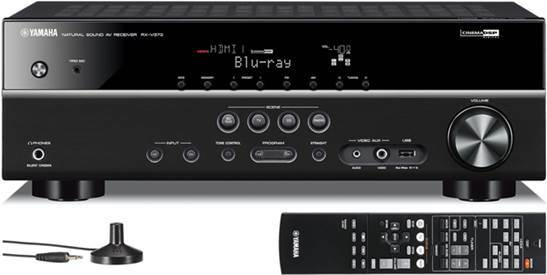 There are four high-speed HDMI inputs, offering 3D support and future-proofing 4K pass-through technology. There’s a USB port in the front for plugging in your iDevice or thumb drive for music playback, but you won’t find networking options on board for any wireless streaming here. That might be expected at this price point, but we do find the lack of video up scaling disappointing – it’s a feature you’ll find in some of its competitors. Another niggle is that there’s only one set of binding-post connectors for the front speaker channel. The rest of the channels make do with spring-loaded connectors. It’s a cost-saving exercise, so not something unseen on kit at this price, but it’s something the other amplifiers on test manage to avoid. Still, what it might lose out on in the battle of the spec sheets, it more than makes up for in performance. Setup isn’t quite as easy as for the other two amps on test, but once done (and you do have to do it only once, after all), you’ll reap the rewards with every listening. During the opening scene of The Dark Knight, the Yamaha picks up subtleties that had been lost or less defined when listening to the same scene with the Sony. As the camera pans over the city buildings, the faint hum of traffic is heard all around you, the uneasy single note of the soundtrack drawing you into the action that’s to come. Then, the weighty thud of the glass window being blown out, packing enough punch to make even a veteran watcher of this scene jump. It’s ‘big-sounding’ for its price, and it spreads sound smoothly and expressively around the room – so much so that you don’t really miss the rear surrounds of a 7.1 system. From the voices of the Joker’s minions to the soundtrack underneath, you feel involved in every uncomfortable minute of the bank robbery as, one by one, the sound of tight, controlled gunshots pierce the mix. The Yamaha is a master of dynamics too. When playing Beyoncé’s live Blu-ray, all the nuances of her voice are conveyed well and with enthusiasm, with impeccable timing and a strong, well-balanced connection to the instrumental accompaniment beneath. CD performance offers more of the same, with great rhythm and impressive separation. This is an accomplished addition to any entry-level home cinema setup. It might not be the most stylish or best specified option here, but its excellent performance speaks for itself. It remains a worthy five-star. The Yamaha may be a stripped-down affair but it still allows direct connection of an iPod/ iPhone to its front panel USB socket. 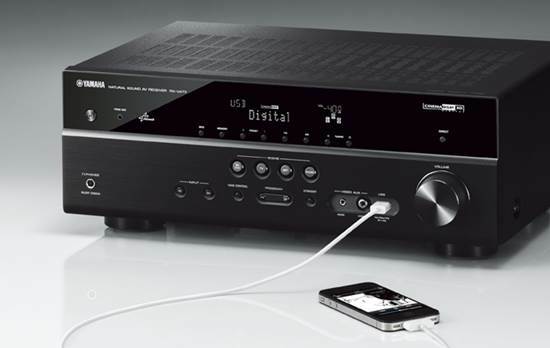 This is a direct digital connection, making the most of the sound quality of your iDevice, and it will charge you’re portable even if the Yamaha is switched off. A USB thumb drive can also be connected. Perhaps a rather predictable winner of this test: the features and performance of the once Pioneer VSX-922 are just too much for the true entry-level options on test to compete with. That’s not to say it was a complete whitewash. 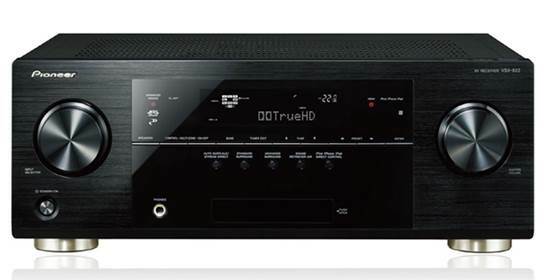 The Sony STR-DH820 loses a star, but it remains a capable choice for those looking for a well-featured budget seven-channel amp. Unfortunately, two years on from release, its sound quality can no longer quite hold its own. The Yamaha showed exactly why we picked it as an Award winner. What it may lack in the style department, it more than picks up where it counts – in its performance. A genuine entry-level option, it offers class-leading sound and the best handling of dynamics here, conveying subtleties that some higher priced amps can’t manage. But it was the Pioneer VSX-922, with all its mid-range bells and whistles, that won us over in the end. The array of features offered with at cheaper market prices is really quite extensive – in particular its network connectivity that adds evens more functionality to your system. Of course its performance, which saw it lost in the competitive mid-range marketplace, shines at its new price point, offering a big, detailed and accurate sound that’ll place you right in the middle of the action during those ‘show-stopper’ moments. A predictable winner it may be, but it’s also a reminder that it’s wise to consider better-specified, discounted kit when looking at equipment in your price-point. The Pioneer VSX-922 is proof that you don’t always get what you pay for sometimes, you might just get more.